Which Everton will turn up this week at Goodison I wonder and think it will be Mr Hyde. John Stones may be feeling a little sheepish facing his pursuers but it is a good opportunity to show what they missed out on. With the main ‘keeper out for Chelsea, they have great back up with Begovic and John Terry should start after returning from suspension, so no problems at the back really. The Blues need to start winning and now should be the time. Go for the Chelsea win. It’s hard to see a Stoke team who have yet to win a game this season breaking that habit against the Gunners at the Emirates. Home fans should see their team win for the first time this season and leave Stoke searching for their first three point result. Top of the table clash – and who would have thought it would involve the Eagles? It is early days, however, and this will be the perfect opportunity for City’s star-studded line-up to show Palace who’s boss. Crystal Palace have been great value so far this season but I can’t see them outlasting the Citizens. In April, Palace beat City at Selhurst Park, and Pellegrini will be out to square the ledger. The Canaries are improving with each outing since promotion and they should have enough goals in them to win this one at Carrow Road. I think that this game has the potential to be a cracker, with both teams going for it. Norwich to get the home win. It’s been a pleasure watching Swansea’s attacking play this term and most pundits would probably expect the likes of Gomis, Ayew and Montero to ply their trade well here. After all, this is the team who just defeated Mourinho’s reigning champions. However, Watford at home should provide stiff resistance and the Hornets and Swans could well share the spoils. Go for the draw at Watford. Southampton were shocking early in the season and they got much better against Norwich City. It’s understandable though, as star players Wanyama and Mane were subject to much transfer window speculation. The Baggies’ Berahino was in the same boat and despite his bitter tweet after being subject to failed offers from Spurs, he’s been training and could well play. Although it’s hard not to go for a draw here, I am predicting a Saints away win. Neither of these two are setting the Premier League on fire at the moment, and often this fixture ends in a draw. No one wants to lose this one and it should be close all the way. I feel a draw coming on. I keep saying that Spurs will get their first win and they have let me down so far. However, with new signings likely to play and with Harry Kane in goalscoring form again, things should change on Sunday. Sunderland are also looking desperately for their first win and they will look to ex-loanee and now new signing Fabio Borini for inspiration. For Spurs, Clinton N’jie could make start if fully fit and Heung-Min Son the same. They certainly need to add a new dimension to a team who have lacked creativity with the absence of Christian Eriksen. Eriksen should return, flanked by Son on the right and Chadli on the left, with Kane the lone front man. At the other end, Jermain Defoe will be the main threat to his former team. The Foxes have been going for it and reaping the rewards this season. Villa have not been looking too confident on the other hand and I expect Leicester to overcome them pretty comfortably. With West Ham looking to reverse their home form with a win and Newcastle searching for their first win of any description, a home win would be expected by most. This is a bit of a coin toss for me, and for that reason it points to a likely draw. Points shared at Upton Park. That’s the Premier League Predictions for Week 5 in the EPL. This entry was posted in EPL Football Betting Tips on 11th September 2015 by Betmeister. Publishing too late to tip this one. Although United looked a bit flat against Spurs and were very fortunate to get the win courtesy of an own goal from Kyle Walker, Chris Smalling has stepped up to the mark in defence in both games. The Saints will be kicking themselves for letting Newcastle claw their way back to share the points last week and with their first game at home I think that they will have a comfortable win. Last season they proved that St Mary’s was a tough place for visiting sides and there’s nothing that suggests Everton will excel away from Goodison Park. Two teams that were well beaten last week will be looking to get fired up and get their first points of the campaign. It would feel natural to predict a score draw for this one but at home the Black Cats should be able to consume the Canaries. Jermaine Defoe looked dangerous last week despite being on the losing side and there could be plenty of opportunities for him against the visitors’ frail-looking back line. Worth noting that Norwich City have not beaten Sunderland away from home in their last 6 attempts. The Swans are on a bit of a roll against the Magpies, having not lost a league game to them in the last 6. That, combined with United’s horror run of away form (7 without a win) including some woeful losses towards the end of last season as they dropped like a stone down the table, indicates a home win. Go for the Swansea win at the Liberty. White Hart Lane will see its first action of the season as the North London outfit look to atone for The Potters’ league double over them last season. Spurs looked good last week against Manchester United but came away with nothing despite creating a few good chances. At home, Tottenham will be desperate to get their first points and Stoke have not won away from home in their last 5 games, losing three of them including the Liverpool home loss last week. Stoke are without captain Ryan Shawcross again. Expecting a few goals to go in at the Lane. Go for a Tottenham win. New boys Watford were unlucky not to take all three points at Everton as they had to settle for a draw thanks to an 86 minute equalizer away from home. The history of clashes between these two reveals that the Hornets have not beaten the Baggies in their last 14 league meetings. And West Brom haven’t lost to Watford away from home in the last 7 matches they’ve played. Having said that, their last head to head match was in 2010 in the Championship. Even still, predicting a draw. Leicester put in a great display at the King Power Stadium to put 4 past a shell-shocked Sunderland. But West Ham provided the shock of the opening week with an amazing win against Arsenal at The Emirates Stadium – Didn’t see that coming at all. If that is what the Hammers can do away, then at home and high on confidence they surely will be able to get the points. The Eagles got of to a flying start by beting Norwich away 3-1 which included a debut goal from new signing Cabaye. Conversely, the Gunners couldn’t get anything at home to West Ham and that was very un-Arsenal like, to say the least. This week, after that kick up the arse, there is little doubt in my mind that Arsene will rev up the Arsenal to victory over Palace. Arsenal to get all the points. A blockbuster here, and I think everyone will take a very keen interest in this game. Chelsea has a first game wobble against Swansea but at least got a point out of it whereas City dominated against West Brom. Go for the City win. Just. From what we saw in week 1, Bournemouth might struggle in the Premier League. While no one wants to see that happen, the signs were there when they opened the campaign at home with a defeat to Aston Villa. Anfield can be a daunting place for visiting teams so I am recommending a Red win. Liverpool to get all 3 points. That’s the Premier League Predictions for Week 2 in the EPL. This entry was posted in EPL Football Betting Tips on 15th August 2015 by Betmeister. For the season opener, I expect a close game but home advantage is key. The Red Devils have splashed out on some exciting looking new players including former PSV Eindhoven forward Memphis Depay and the Dutchman should join Wayne Rooney up front. United are more than ready to banish the memories of Radamael Falcao’s misses and forge a new strike partnership to frighten any opponent. There will be no David DeGea (being kept in cool storage for a certain Spanish club) or Bastian Schweinsteiger (fitness) on Saturday. Tottenham’s last visit to OT ended in a 3-0 loss which was their first defeat to United in a few years, so they will be looking to a new-look defence to keep in the game until the end. As for Spurs’ forward threat, it seems to be all about Harry Kane again. The White Hart Lane team have not strengthened in their attack much and will hope that he stays fit for as long as possible until some backup arrives. Soldado and Adebayor surely must be leaving during this window. I think that Villa are going to find themselves in a real cauldron on Sunday and the Premier League new boys will find what it takes to take the points. At Goodison, the Toffees surely will grab the points with all of those experienced PL players. Plus, Martinez will be pumped up and ready to get his team to improve on last season’s slip down the table. Can see Leicester continuing on their good form of last season, spurred on by strong home support. Palace under Pardew were going places fast last term and Norwich might find them too much if that confidence continues. Last season, the little horse turned into a stallion that galloped away with the title almost from t he start. Built again around defensive quality first and foremost, it’s a sure bet that Blues boss Mourinho will again set up not to lose games in 2015/16. Not that he’s got a bad midfield or forward attack either! However, their rivals are also trying to buy their way to the title just like Chelsea have consistently done thanks to their mega-wealthy owner’s backing. That said, Swansea are no mugs and have proven that they can push top teams away from home in recent seasons. We’ll have to find out which Swans turn up but the likes of Gylfi Sigurdsson, still just 25 years old and with plenty of experience, is a dangerous goalscoring midfielder to watch. Arsenal tend to hammer the Hammers home and away but they do it especially hard at the Emirates. Expect this trend to continue. This season, the Magpies need to get off to a good start to give their long-suffering fans a lift. However, I think that the Saints will prove too strong. It will be interesting to see if I’m right. As everyone knows, these two met one Premier League match ago at the same venue and Liverpool got absolutely caned. That kind of pain can work wonders for plotting revenge – but the Potters are strong at home and can share the points. It’s hard to see West Brom overcoming a Citizens side who have added even more quality players. Raheem Sterling will be there, champing at the bit to play well with his new Money City team mates. Perhaps the Baggies can thwart them but it would take a brave punter to bet against City. This entry was posted in EPL Football Betting Tips on 7th August 2015 by Betmeister. The usual suspects in Aguero, Rooney and Costa are of course in the mix again to score the most goals in 2015/16. But there are some other good prospects to win it for the upcoming season. Following their stunning strikes in a pre-season friendlies for Liverpool and Spurs respectively, we think that having a bit of Christian Benteke at 16/1 or Harry Kane at 12/1 look like pretty good value. 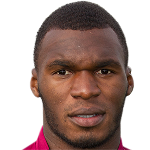 Benteke’s record for Aston Villa speaks for itself: 42 goals in 89 appearances over 3 seasons. One would have to imagine that the Belgian will receive much better service at his new club, so the chances of him bettering his debut 2012-13 season at the Villans (19 Premier League goals) where his contribution kept them from the relegation zone (they finished 15th), are high. Whereas no Englishman has won the Premier League golden boot since Kevin Phillips in 1999/2000, there is a good chance that this could change in 2015/16. Harry Kane’s 21 goals in 34 appearances last season was a club record alongside the likes of Teddy Sheringham, Jürgen Klinsmann and the world’s most expensive player, Gareth Bale. As the season wore on, Kane had to deal with a lot of extra attention from opposition defenders after it became clear that great goals against the likes of Chelsea and Arsenal, where Spurs recorded stirring victories, were no flash in the pan. 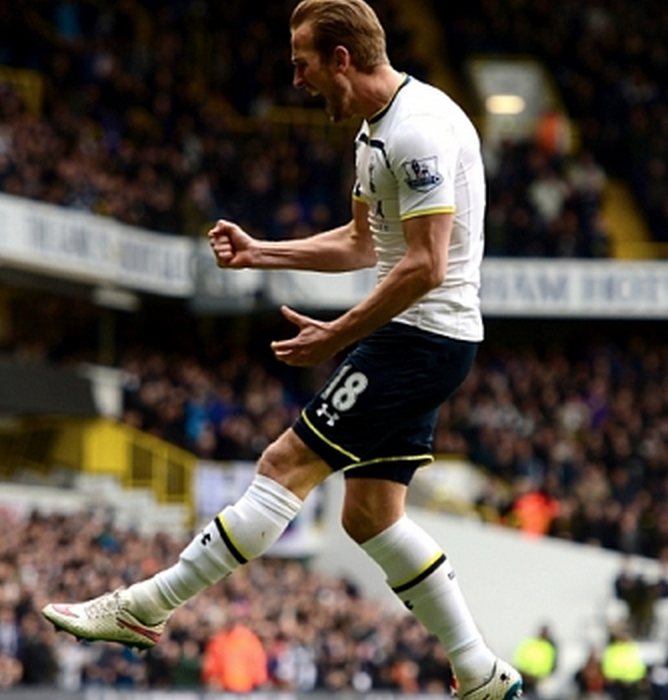 Kane at 12/1 for top goalscorer looks to also be a decent value bet, even if it is a little short for our liking. To the question of who will be crowned Premier League champions, and at this stage most can only realistically see this being either Arsenal, Chelsea or Manchester City. Manchester United should be back in the mix after spending big yet again, but it would be an absolute delight to see the a non-fancied team spring a real shock. So, if you were going for an outsider bet in order to take a punt on massive odds, would it be a total waste of time and money? Very probably, history suggests. Liverpool are a team that nearly managed to pull off such a shock a couple of seasons back, only to fall agonisingly short. The Reds are at 20/1 which shows how wary the bookmakers are of them doing something special again. For the optimistic, Leicester City can be backed at 2000/1 and potentially higher at some bookmakers. The Foxes managed to beat the drop with a strong finish last season and a sustained, consistent continuation of that form would make for a huge payday. For odds on teams with perhaps an even more realistic possibility of doing it, you could look to Tottenham (100/1), Everton (250/1) or Southampton (200/1). This is where the stars would have to align perfectly for one of those teams and the current favourites would need to all be taking points of each other. The issue that these ‘top 8’ teams have had since the Premier League began is consistency. We know that on top form, these teams can beat any other in the Premier League. The problem is that no team can maintain top form over an entire season, what with the mix of injuries, suspensions, different conditions, bad luck etc. However, the top 3 or 4 teams always seem to have that extra bit of quality and squad depth that means that they’re able to win even though they aren’t on top form. There are, of course, quite a few other pre-season markets to examine such as Relegated Teams, Top 3,4,5,6 & 7 Teams, Top Newcomer, TriCast and much more. There’s even a market on the Sides To Go Unbeaten in 2015/16’s Premier League, and Chelsea are 125/1 for example. We’ve taken this market information online from bookmaker bet365, who have the most generous of all joining offers with a £200 deposit bonus (Find our review of their mobile app here.) As usual, we’ll be keeping track of football scores with great interest throughout the season to see how things develop. This entry was posted in EPL Football Betting Tips and tagged Premier League Betting, Premier League Pre-Season on 3rd August 2015 by Betmeister. This entry was posted in EPL Football Betting Tips, Football Betting on 1st February 2015 by Betmeister. With Chelsea looking to tonight at the Britannia as an opportunity to stay ahead on points of Manchester City, this one could well be a tense affair. For fans of these clubs and the neutral it’s the only English Premier League match on today so there will be a huge festive television audience watching. To make this match even more interesting, here are some Price Boosts available from Sky Bet (kick -off at 8pm and live on Sky Sports). Click on a bet below to take you to Sky Bet. Our pick of the value bets are the highlighted ones. These price boosts are for all new and existing Sky Bet customers. For 4/1 enhanced odds on Chelsea to win and money back if your bet loses (for new Betfair customers) click here. If you haven’t already, see our review of Sky Bet mobile, which is available for Android and iOS. It’s one of the better mobile apps that features in the top betting apps review. This entry was posted in Bookie Offers, EPL Football Betting Tips and tagged Chelsea Betting, Price Boosts, Stoke City Betting, Stoke v Chelsea Head to Head on 22nd December 2014 by Betmeister. Alerting you to a new special offer that looks pretty tempting. It’s for new customers to Betfair. They are offering 5/1 on Manchester United to beat West Bromwich Albion in tonight’s match at The Hawthorns. If your bet loses, you get your money back in the form of a free bet. This is one of those bets known as ‘risk free’ and is of course designed to bring new customers to Betfair. You really can’t lose with this one. Oh and if you didn’t get a chance to see the own goal of the season (so far) you can do so here. For loads of updated free bet offers like these and a football betting calculator, we recommend installing the BookieBoost app:. This entry was posted in EPL Football Betting Tips, Football Betting and tagged Manchester United Betting, Premier League Betting, West Brom Betting on 20th October 2014 by Betmeister. Get 3/1 on Liverpool to wear Red at home against Everton – MFOR! Alerting you to a MFOR (money for old rope) offer for new customers to Betfair. They are offering 3/1 on the Anfield outfit to wear red against their local rivals Everton on Saturday. You’ll want to be quick to snap up this offer which is a ‘gimme’ if there ever was one. Look under ‘Specials’ under ‘Football’ and you will find the offer while it still lasts – because it is limited to the first two thousand sign ups. To get the 3/1 special for Liverpool to wear Red, click here. 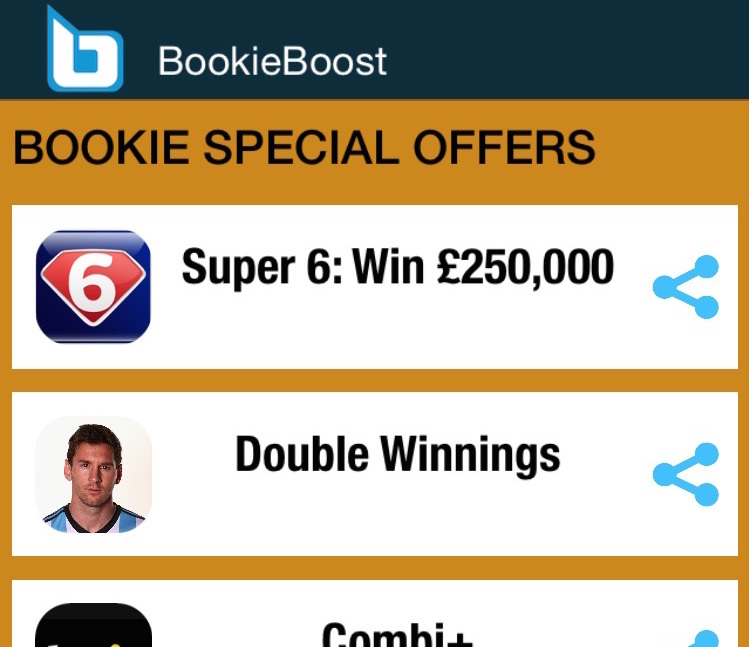 or download the BookieBoost app to see this special offer under ‘Bookie Special Offers’. This entry was posted in EPL Football Betting Tips, Football Betting and tagged Betfair, Everton, Liverpool on 26th September 2014 by Betmeister. The Premier League title is up for grabs and Liverpool have fluffed their lines that should have left enough room for Mn City to take the title. But who can say in this unpredictable of all seasons. With Cardiff and Fulham already relegated, will it be Norwich, West Brom or Sunderland going down with them? Surely it must be the Canaries who must beat Arsenal and rely on Sunderland losing twice to have any chance. To the full Week 38 tips…. We wish you the best of luck in using these EPL Week 38 predictions in your betting. We’re tipping our Premier League betting tips predictions over the full Barclays Premier League season. The rules of engagement are 1 point for the correct result and 3 points for correct result with the correct score. Also, see links to the best football betting sites to get a lowdown of a selection of the best sites. Using EPL Week 38 Predictions to bet from a mobile? Take a look at iPhone betting apps, Android betting apps and BlackBerry betting apps. This entry was posted in EPL Football Betting Tips, Football Betting and tagged Premier League tips on 1st May 2014 by Betmeister. On Saturday 3rd May in the early kick-off it’s Tottenham Hotspur making the short trip east to West Ham. The Hammers have had the wood over Spurs this season, twice beating them at White Hart Lane when AVB was in charge. Can they do it at home? Spurs have a great away record and proved that by winning away at Stoke last time out. Manchester United looked good under their new manager Ryan Giggs in the 4-0 demolition of Norwich City but they face a stern test against a Sunderland team who are finishing the season in a way that Houdini would be proud of. The Black Cats also come off a 4-0 annihilation of Cardiff City. But at Old Trafford it will be much tougher. Fulham let a 2-0 lead slip against Hull and they face the daunting task of Stoke City at the Britannia Stadium. The Potters are smarting from a rare home loss to Spurs and will likely bounce back – although Fulham have far more to play for as they face the drop. Swansea against Southampton does not hold too much interest regarding the outcome, with both teams safe in mid-table having ensured another season in the EPL. Looks like it could be honours even and hard to pick a clear winner although home advantage must be considered. Newcastle United are playing host to Cardiff City and while the Magpies don’t have much to play for at the moment, Cardiff certainly do. The Bluebirds are at rock bottom and a defeat will complete their demise and send them down. Aston Villa can take a step towards safety by beating Hull at Villa Park and with one eye on the FA Cup Final, perhaps the Tigers (who already look safe) will take their foot off the accelerator. Everton are spluttering towards the finish line and need to beat Manchester City at home in the late Saturday game. Can’t see City losing this which means that the Toffees will probably not be able to finish in the top four now. On Sunday at 13:30 Arsenal host West Brom and a win could see them seal fourth spot, depending on other results. The Gunners are old pros under Wenger at grabbing that fourth Champions League place and seem to do it every year. This year looks to be no different and the Baggies look safe enough from relegation – Arsenal will surely be too strong at the Emirates. Chelsea have what looks like a regulation three points in the bag as the hapless Norwich City visit Stamford Bridge. The Canaries have had the daunting prospect of facing Liverpool and Man Utd in the last two games and now come up against Mourhino’s men. 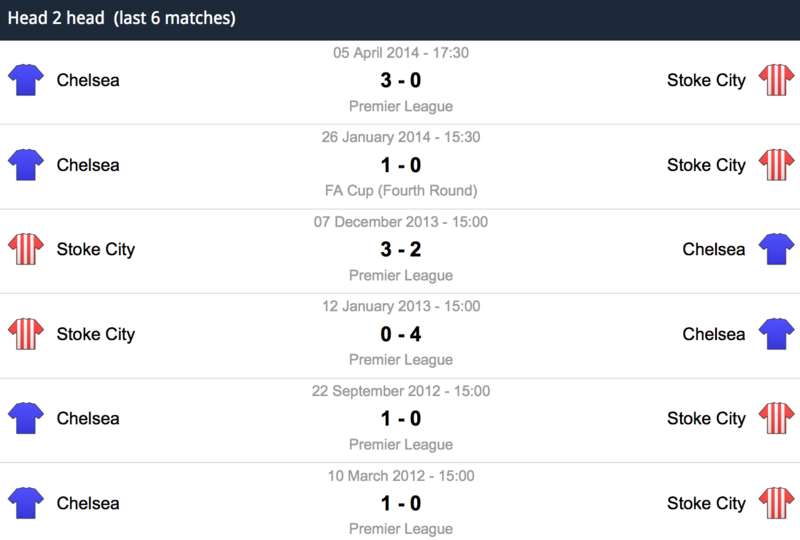 Norwich have now lost all of their lat five games and look certain to make it six. Will it be back to the Championship next season? On Monday night, Crystal Palace host Liverpool in what should be a very tense affair for every Reds fan. The Eagles have have now won their last five in a row including victories over Chelsea and Everton. Tony Pulis has Palace purring and they have climbed from the bottom to the middle of the table in the process. The Reds had tough game against a weakened Chelsea at Anfield on Sunday. If the players start to think too much about the title and nerves play a part in this game, anything might happen. To the full Week 37 tips…. We wish you the best of luck in using these EPL Week 37 predictions in your betting. We’re tipping our Premier League betting tips predictions over the full Barclays Premier League season. The rules of engagement are 1 point for the correct result and 3 points for correct result with the correct score. Also, see links to the best football betting sites to get a lowdown of a selection of the best sites. Using EPL Week 37 Predictions to bet from a mobile? Take a look at iPhone betting apps, Android betting apps and BlackBerry betting apps. This entry was posted in EPL Football Betting Tips, Football Betting and tagged Premier League tips on 27th April 2014 by Betmeister. To start proceedings, a real test is in store for Everton who must go to St Mary’s and take on Southampton and win to continue their top four push. The Saints have not been too hot lately and the Toffees should take full advantage and win. If they fail to do so, Arsenal will definitely not let fourth place slip. Beating Manchester United was important to keep the pressure on the Gunners. Disappointing Tottenham are out of the race for fourth now and must also go away to beat a team in red and white stripes to earn another season of Europa League action with their tough trip to the Britannia against Stoke City. Manchester United host Norwich City with the Canaries desperate for points as they hover around the relegation zone. They can take heart from United’s vario us home losses this season but will need to work their socks off to get a result at Old Trafford in this new post-Moyes era. It’s difficult to see a Norwich away win, especially with United coming off a loss but a draw could be reasonably expected. At Craven Cottage, Fulham host mid-table Hull City. Hull’s FA Cup final dress rehearsal against Arsenal did not go well at all and another loss here could drag them back into the relegation dog fight. We think it’ll be Fulham to win at home. Sunday sees the title contenders in action. Liverpool who are now hot title favourites after their win at Carrow Road take on Chelsea at Anfield in what promises to be a monumental contest. Should the Reds win here it’ll all over for the Mourhino’s little horse this season. After suffering the first home defeat in 78 games under their manager following Fabio Borini’s goal, it’s win or bust for Chelsea. This should be a great game. Manchester City are still in with a shout of the title and they visit Crystal Palace. Palace defeated Chelsea at this ground just weeks ago and are on an amazing run. Tony Pulis is thriving and City are wobbling after dropping more points against Sunderland. On Monday it’s Arsenal at home to Newcastle United. The Gunners seem to be on cruise control as they see out the season to yet again take the fourth Champions League place. With Newcastle safe from the drop zone and with seemingly nothing to play for a home win seems to be the logical choice. To the full Week 36 tips…. In other matches, go West for the Baggies against the Irons. West Ham have not been great in recent weeks and West Brom have to get the points to secure survival. West Brom’s desperation should see them win here. Swansea City are at home to Aston Villa and this game is a similar situation. Difficult to pick a winner and a draw looks likely. Resurgent Sunderland take on Cardiff City. With all of the bottom teams showing fighting spirit in recent weeks this should be a beauty. Gus Poyet has worked wonders with the Black Cats’ win at Chelsea and a draw against Manchester City since the 5-1 loss to Spurs and narrow loss to Everton. Cardiff are not dead yet but the form book seems to favour Sunderland. We wish you the best of luck in using these EPL Week 36 predictions in your betting. We’re tipping our Premier League betting tips predictions over the full Barclays Premier League season. The rules of engagement are 1 point for the correct result and 3 points for correct result with the correct score. Also, see links to the best football betting sites to get a lowdown of a selection of the best sites. Using EPL Week 36 Predictions to bet from a mobile? Take a look at iPhone betting apps, Android betting apps and BlackBerry betting apps. This entry was posted in EPL Football Betting Tips, Football Betting and tagged Premier League tips on 18th April 2014 by Betmeister. Tottenham Hotspur take on Fulham at White Hart Lane in the early Saturday kick-off. The Cottagers are now desperate to avoid the drop and will have to play great football to overcome Spurs away from home, but they have shown great spirit of late, and were correctly predicted by both of our resident tipsters to beat Norwich (with an exact 1-0 scoreline from Betmeister). In the next featured match Chelsea host Sunderland at Stamford Bridge. The Black Cats are not in any form to threaten Jose Mourinho’s team at the moment. However, they do have some form – The last time these two met was in the Capital One Cup where Sunderland defeated the Blues 2-1. You have to go back to November 2010 when the Black Cats last won at Stamford Bridge. That was under Carlo Ancelotti and he saw Steve Bruce’s men put on a fantastic display to win 3-0. In the early Sunday kick off, Liverpool travel to Carrow Road to terrify the life out of Norwich City. The Canaries will surely crumble against the Reds’ magnificent strike force. Head to head, Liverpool have won 33 games against Norwich, lost 14 and drawn 14. The last time that the Canaries tasted success in this fixture was away at Anfield on 30th April 1994 – almost 20 years ago – and Liverpool will no doubt make it 10 in a row in the Premier League undefeated against them given their current form. At 14:05 it’s Hull City hosting Arsenal and it’s not beyond the Tigers to spring a surprise on the their fellow FA Cup finalists who have pressure on them to win every match to finish fourth. However, the Gunners always seem to do just that and Professor Wenger ends up having the last laugh (note Everton’s recent unexpected loss). Incidentally, Hull have beaten Arsenal just twice in the last 100 years (1915 and 2008) in which period they’ve met 12 times. Arsenal have won 9 of these games, with the other one drawn in 1930. In the late Sunday game, Everton take on Manchester United at Goodison Park and this really is a most intriguing tie. Prior to their slip-up the Toffees needed to win every game to guarantee finishing fourth but now it’s advantage Arsenal. The Red Devils want the win to get into the Europa League next season – with the faintest of hopes of fourth for themselves. Who would have predicted that for the current Champions of England just 12 months ago? Everton beat United at Old Trafford in December in their last meeting and wins against them are becoming more common. Everton have only lost to United once in their last four meetings, winning two of them. David Moyes won’t be such a darling at Goodison if United win here. On Monday night Manchester City take on West Brom at the Etihad Stadium which on the surface of things looks to be a banker for the Citizens. Although the Baggies got 3-0 up against Spurs and ended up fortunate to get a draw (remember Adebayor missed a penalty), it seems that they will need an even bigger head start to take any points in this one. City are very likely to rebound to keep their title hopes alive. To the full Week 35 tips…. In other matches, West Ham host Crystal Palace and a tight contest is expected. Palace have had such a good second half of the season. Cardiff City will do well to stave off an in-form Stoke City with the Bluebirds facing the drop despite their shock away win over Southampton that no one saw coming. Newcastle United are at home to Swansea City whilst Aston Villa host Southampton. We wish you the best of luck in using these EPL Week 35 predictions in your betting. We’re tipping our Premier League betting tips predictions over the full Barclays Premier League season. The rules of engagement are 1 point for the correct result and 3 points for correct result with the correct score. Also, see links to the best football betting sites to get a lowdown of a selection of the best sites. Using EPL Week 35 Predictions to bet from a mobile? Take a look at iPhone betting apps, Android betting apps and BlackBerry betting apps. This entry was posted in EPL Football Betting Tips, Football Betting and tagged Premier League tips on 8th April 2014 by Betmeister. Manchester City take on Southampton at the Etihad in the early kick off. The Saints are not going to be easily beaten by anyone but City’s home record speaks for itself. The Citizens to get over the line and maintain their title push. Another City goal-fest looks less likely here. Chelsea feature in the later 17:30 fixture and host a tough Stoke City outfit who are firmly entrenched in the middle of the table. With the Blues having fluffed their lines against Crystal Palace last week and surrendering top spot, this is a must win and you’d have to be very brave not to back them at home – a win by a comfortable margin is expected at Stamford Bridge. Sunday features the two teams from Merseyside with Everton at home to Arsenal at 13:30 and what an interesting tie this is. Should Arsenal lose it would open the door for the Toffees to look to overhaul them in fourth place over the remaining games. This is a real six pointer but the Gunners showed that they had what it takes in a similar situation with Tottenham Hotspur a few weeks ago. Expect this to be nervy given the importance of the game. The rampaging goal-scoring machine known as Liverpool FC are also in action on Sunday 6th April in the late kick-off as they travel to East London to take on West Ham. The table-topping Reds should will surely secure another victory with their exciting brand of football against a Hammers side who run hot and cold. To the full Week 33 tips…. In other matches Cardiff must get something against Crystal Palace to keep any escape hopes alive and Hull City at home to Swansea City looks like a very even match up. Norwich City should be too good at Carrow Road for West Brom and similarly Aston Villa must surely get all of the points when hapless Fulham come to Villa Park on Saturday. Unpredictable Newcastle host reigning champions Manchester United and will need to play well if they are to take points from David Moyes’ men who are having a slightly improved last quarter of the season. The natives are restless at Old Trafford given this season’s sub-par performances and less that all three points here will increase the scrutiny. 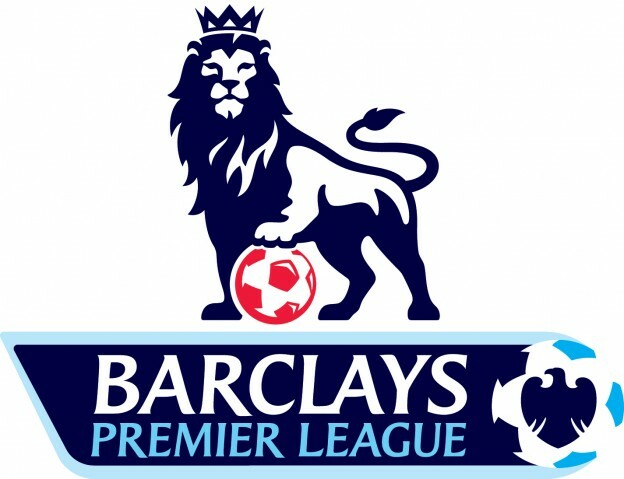 On Monday night Tottenham Hotspur entertain Sunderland who are languishing near the bottom of the league. Spurs will be looking to keep their now faint top four hopes alive and you’d expect them to have too much quality for the Black Cats. We wish you the best of luck in using these EPL Week 33 predictions in your betting slips. We’re tipping our Premier League betting tips predictions over the full Barclays Premier League season. The rules of engagement are 1 point for the correct result and 3 points for correct result with the correct score. Also, see links to the best football betting sites to get a lowdown of a selection of the best sites. Using EPL Week 33 Predictions to bet from a mobile? Take a look at iPhone betting apps, Android betting apps and BlackBerry betting apps. This entry was posted in EPL Football Betting Tips, Football Betting and tagged Premier League tips on 28th March 2014 by Betmeister. Arsenal host Manchester City at 17:30 on Saturday 29th March in the game of the week. Can the Gunners prove the doubters wrong? If so, this is the time to do it. Arsenal slipped on a big banana peel on Tuesday night by conceding late against Swansea City (with the exact 2-2 scoreline predicted by Betmeister) and if they lose here fourth spot is far from guaranteed. Conversely, City fans are on a high after their team downed Manchester United on Tuesday night at Old Trafford and surely must win this if they are to win the title. Crystal Palace need points and Chelsea are not going to give those up easily but the Eagles are capable of an upset as we’ve seen before. After the 6-0 demolition job that the Blues did on Arsenal last week it’s difficult to see them slipping up at Selhurst Park. Liverpool look set to continue their strong push for the title and really cement their place in next season’s Champions League when Tottenham come to Anfield. The winning streak for the Reds is now up to seven after the narrow win against Sunderland midweek. Spurs have found the going tough against top four opposition this year and will be out to prove a point of their own. Not many will bet against the Reds from continuing on their merry way at home after they thrashed Tottenham at White Hart Lane not so long ago. However, if Spurs can keep it tight and rattle Liverpool like Sunderland did, the winning streak may not extend to 8. To the full Week 32 tips…. In other matches, a depressed Manchester United can only try to sneak closer to the Europa League place with a win over Aston Villa who were also well beaten at Villa Park at the weekend by Stoke City. United need to be finishing strongly now and Wayne Rooney has been showing some great form despite the midweek loss to Man City. Swansea v Norwich is a tough call but the Swans looked good against the Gunners midweek – and Stoke v Hull is another tough call. Fulham will be looking to spring a surprise over visiting Everton and they they need it badly. However, the Toffees are flying and will be aiming for Champions League football next season at this rate. West Brom have their problems but they should get the points over visiting Cardiff City who look certainties to return to the Championship. Southampton should be just a little too hot for Newcastle to handle at St Mary’s and on Monday night Sunderland take on West Ham at the Stadium of Light. The Black Cats will also be desperate for all the points. It’s a season-defining game for them. We wish you the best of luck in using these EPL Week 32 predictions in your betting. We’re tipping our Premier League betting tips predictions over the full Barclays Premier League season. The rules of engagement are 1 point for the correct result and 3 points for correct result with the correct score. Also, see links to the best football betting sites to get a lowdown of a selection of the best sites. Using EPL Week 32 Predictions to bet from a mobile? Take a look at iPhone betting apps, Android betting apps and BlackBerry betting apps. This entry was posted in EPL Football Betting Tips, Football Betting and tagged Premier League tips on 20th March 2014 by Betmeister. And what a feast of football we have in store in EPL Week 31. In the games impacting most on the title race, Chelsea host Arsenal on Saturday 22nd March before the Gunners play at home to Swansea City in midweek. The Gunners were outplayed by Spurs yet somehow managed to nick all 3 points on Sunday thanks to an early wonder goal. 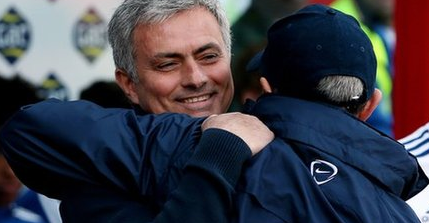 Jose Mourinho now has a 75 game unbeaten run at Stamford Bridge which is quite an amazing record. Liverpool go to Cardiff City on Saturday and then midweek they are in action again against Sunderland at Anfield in what looks like a couple of routine victories. The Reds dismantled Manchester United at Old Trafford and are in with a real shot at the title especially given their lack of European football this season. Manchester City look to have the simplest task when Fulham visit the Etihad Stadium before heading across town to try and beat the once mighty Manchester United. To the full Week 31 tips…. Speaking of Manchester United, the Red Devils face a tricky trip to the dangerous West Ham for the 17:30 kickoff and we expect a tight game. This United team are now playing for a Europa League place at best and even that looks unlikely at this stage despite their fantastic win over Olympiakos in the Champions League on Wednesday night. On the 23rd March Tottenham Hotspur must win at the Lane when Southampton visit to hold out any remote hope of a top 4 finish, coupled with one of the top four going on a losing streak which looks equally unlikely. Aston Villa, buoyed by their deserved win over Chelsea, take on Stoke City in the 16:00 kickoff on Sunday’s other match. This is another close call but Villa are looking good and should edge it. We wish you the best of luck in using these EPL Week 31 predictions in your betting. We’re tipping our Premier League betting tips predictions over the full Barclays Premier League season. The rules of engagement are 1 point for the correct result and 3 points for correct result with the correct score. Also, see links to the best football betting sites to get a lowdown of a selection of the best sites. Using EPL Week 31 Predictions to bet from a mobile? Take a look at iPhone betting apps, Android betting apps and BlackBerry betting apps. This entry was posted in EPL Football Betting Tips, Football Betting and tagged Premier League tips on 14th March 2014 by Betmeister. Manchester City going to Hull City is unlikely to spring a surprise result such is the difference in quality combined with City’s determination to bounce back from their FA Cup and Champions League exit to Wigan and Barcelona respectively. Perhaps Steve Bruce will use similar tactics as Wigan did, but it’s unlikely lightning will strike again. Aston Villa host Chelsea and with Benteke back in form they could conceivably cause the Blues some problems. Now that would be a result that the title race really needs because Chelsea are starting to run away with it. Sunday doesn’t get much more super than this – First, there’s Manchester United hosting title chasing Liverpool at Old Trafford. And how Red Devils fans would relish denting that dream. Moyes would have to get them really revved up if they are to get a result. A must-see for die-hards and neutrals alike. Then Arsenal must overcome Tottenham at White Hart Lane in the North London derby in order to keep their waning title hopes on track. 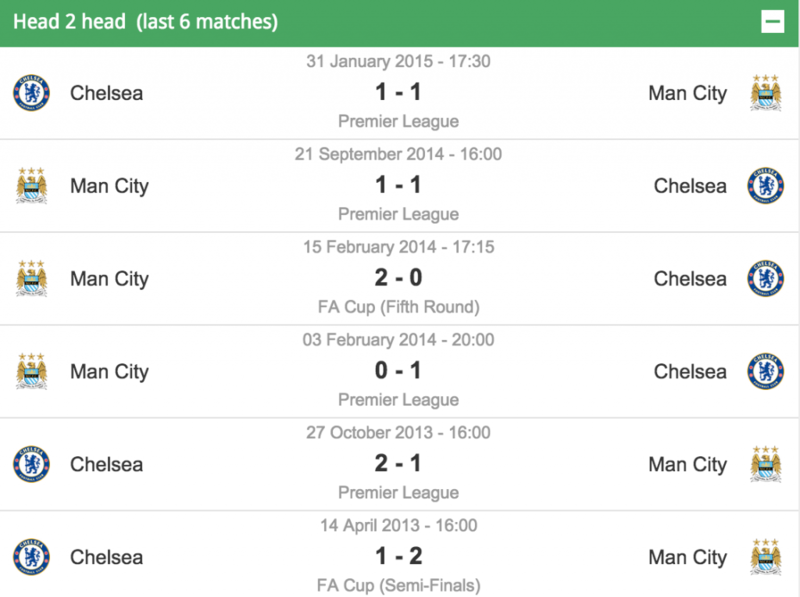 Spurs have not done well against teams above them this season, as demonstrated in their capitulation at Stamford Bridge. It’s going to be loud. To the full Week 30 tips…. In other matches impacting things further down the table, Sunderland can beat Crystal Palace at home, Southampton should account for Norwich comfortably and Fulham could spring a surprise against unpredictable Newcastle who now look safe against the drop but with not much to play for. Everton will surely be too strong for Cardiff, Stoke v West Ham has draw written all over it, and Swansea should edge out West Brom. We wish you the best of luck in using these EPL Week 30 predictions in your betting. We’re tipping our Premier League betting tips predictions over the full Barclays Premier League season. The rules of engagement are 1 point for the correct result and 3 points for correct result with the correct score. Also, see links to the best football betting sites to get a lowdown of a selection of the best sites. Using EPL Week 30 Predictions to bet from a mobile? Take a look at iPhone betting apps, Android betting apps and BlackBerry betting apps. This entry was posted in EPL Football Betting Tips, Football Betting and tagged Premier League tips on 2nd March 2014 by Betmeister. Arsenal travel to Stoke who need points to avoid being sucked into the relegation dogfight. The Gunners usually get their noses in front of games like this and can’t afford any slip-ups. Chelsea make the short trip to Craven Cottage and are fully expected to make short work of Fulham who are looking a bit toothless since Dimitar Berbatov left them in the lurch. Liverpool make the long trip to Southampton and this one could hold a surprise. The Saints had been going along OK until the setback against West Ham and have occasionally caused problems for the teams above them, having held Arsenal 2-2 at the Emirates on Jan 28th. The Reds will need to be on top form at St Mary’s. To the full week 28 tips…. In other games, Tottenham Hotspur host Cardiff City and despite Spurs’ home form being ordinary this season, they should be able to cope with the Bluebirds and get over the line at the Lane. Cardiff are on the ropes at the moment after the mauling by… Hull City, who host Newcastle United. Ever since the departure of Cabaye the Magpies look a weakened team with not a lot to play for. Hull may be more desperate for the points at the KC with Pardew’s relief at beating Villa palpable. Everton come up against a resurgent West Ham at Goodison and although a Hammers win would be a slight surprise, the Toffees need to win to at least now make a challenge for that final Champions’ League position so their desire should see them through. Aston Villa will need to stave off Norwich City and with this being at Villa Park it should give them a slight edge. Another very even-looking match up happens at the Liberty on 2nd March when Crystal Palace visit Swansea City. You could just about toss a coin for the result of this one although the better odds would be on Palace. Manchester United against Manchester City has been postponed to Tuesday 25th March and Sunderland v West Brom is also postponed, meaning that there are only 8 matches on March 1&2. Lawro (7 points) widened the gap in this 3 horse race and Little Sidekick pulled out another 10 point blinder in EPL week 27 predictions – Betmeister (5 points) is starting to look over his shoulder now. Good luck in using our EPL week 28 predictions in your tipping bets slips. We’re tipping our Premier League betting tips predictions over the full Barclays Premier League season. The rules of engagement are 1 point for the correct result and 3 points for correct result with the correct score. Also, see links to the best football betting sites to get a lowdown of the best sites to have a flutter. This entry was posted in EPL Football Betting Tips, Football Betting and tagged Premier League tips on 18th February 2014 by Betmeister. League leaders Chelsea have the early kick-off at Stamford Bridge and smarting from their FA Cup exit should be too hot for Everton who really need a result to keep in the hunt for the fourth spot. Second-placed Arsenal should have it their way at The Emirates Stadium, with the Gunners facing a Sunderland team still battling away near the foot of the table. Manchester City host Stoke and although the Potters have had some good games this season, they have mostly come at home – and City, well their quality means they surely won’t slip up at home again. It’s entirely possible that we’ll see Liverpool hand out another thrashing to Swansea – so frequent their goal-fests have become. To the full week 27 tips…. In other notable matches Tottenham face a tricky tie at Norwich in the late kick off on Sunday and could be tired after their visit to FC Dnipro on Thursday night. Spurs do, however, have the best away record in the Premier League and won for the first time in a decade against Newcastle last time out. Manchester United are now surely out of the title race and to have any chance of getting in the top four (David Moyes’ stated target) must go to Crystal Palace and win. However, Palace have been in great form and will be no easy-beats. We’re tipping our Premier League betting tips predictions over the full Barclays Premier League season. The rules of engagement are 1 point for the correct result and 3 points for correct result with the correct score. Also, see links to the best football betting sites to get a lowdown of the top places to have a flutter. Betmeister had a shocker in week 26 with no correct predictions which allowed Little Sidekick to gain badly needed ground – with 2 exact scores he is now 7 points closer. This entry was posted in EPL Football Betting Tips, Football Betting and tagged Premier League tips on 11th February 2014 by Betmeister. Betting tips are back on as we approach our EPL Week 25 predictions. As as the battle for the English football tipping crown continues, the Premier League battle gets ever more interesting. Can Liverpool beat Arsenal or will the Gunners survive one of their sternest credential-testers? Spurs v Everton is another game to watch and may impact who ends up in the European places. So many title contenders in a hotly contested season. Right, to our week 25 tips…. This entry was posted in EPL Football Betting Tips, Football Betting and tagged Premier League tips on 3rd February 2014 by Betmeister. It’s time for EPL Week 24 predictions here on betting sites as the battle for the championship of English football tipping carries on with all the games bar one being played on the weekend. That final game, of course, is the big one that could have a big bearing on the race for the title of course – Man City v Chelsea at 8pm Monday night. Can Liverpool continue on their charge for the title after whipping Everton and will Manchester United now go on a run now that Juan Mata has provided a new spark? Hold on tight, to our week 24 tips…. Lawro has skipped away from Betmeister again with some very impressive football tipping predictions – how does he keep getting so many exact score 3 pointers!? Meanwhile, the points gap between our own cellar dweller Little Sidekick and Betmeister surely looks insurmountable. Don’t forget it’s the Super Bowl coming up – Sports Interaction, Canada’s top online bookmaker is offering a $200 signup bonus. This entry was posted in EPL Football Betting Tips, Football Betting and tagged Premier League tips on 29th January 2014 by Betmeister.